The Alfa Romeo Issima is a concept design car by the Swiss engineering company Sbarro. 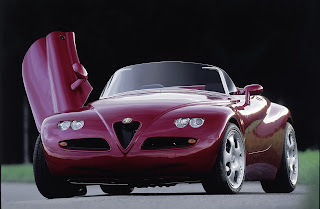 The Issima was introduced in the 1996 Geneva Motor Show, it is equipped with two 3 litre V6, creating a V12 with 500 horsepower. wheels: front : 8,5 x 19 " / rear : 11 x 19 "
Last updated on 10 December 2013 at 21:24.